What happens when my cat is put down? Facing the difficult decision to have your cat put down? Take a look at our guide. While many cats live a long and happy life, there comes a time when you might notice that your cat's quality of life is being compromised and you'll have to make the difficult decision to have your pet euthanased. Whether you're concerned about making the right decision, or want to be prepared when the time comes, our guide will give you the information you need. Before your cat is put down, you'll be asked to sign a consent form. Your vet will shave fur from a patch of skin on one of your cat's front legs and insert a needle into a vein. The vet will then administer a drug that makes your cat lose consciousness. If your cat is stressed or aggressive, they may be given a sedative before the injection, to ensure their final moments are as stress-free as possible. Your cat will be asleep in a very short time and their heartbeat will stop a few moments later. You can decide in advance whether you'd prefer for your cat to be buried or cremated. Your vet can arrange for your cat to be cremated, or you can take them to the pet crematorium yourself. Your cat can be cremated with other cats and their ashes scattered in the garden of rest, or you can opt for an individual cremation and have the ashes returned to you. Alternatively, your cat can be buried in a pet cemetery. Most ceremonies can be followed by a short memorial service. If you would prefer to bury your cat in your garden, check with your local authority to ensure this is allowed. Losing a pet is never easy and can be a traumatic experience. 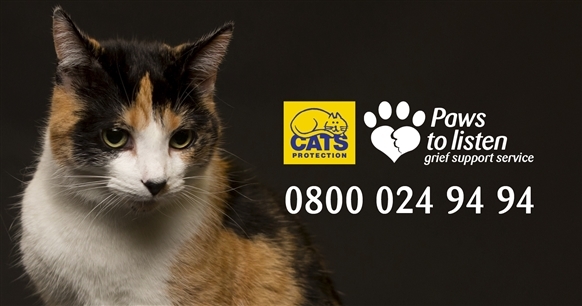 If you need help and support, visit the grief and loss pages on our website, where you'll find contact details of our designated Paws to Listen telephone service.